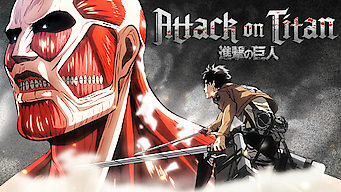 How to watch Attack on Titan: Season 2 (2013) on Netflix Argentina! Sorry, Attack on Titan: Season 2 is not available on Argentine Netflix, but you can unlock it right now in Argentina and start watching! With a few simple steps you can change your Netflix region to a country like Japan and start watching Japanese Netflix, which includes Attack on Titan: Season 2. We'll keep checking Netflix Argentina for Attack on Titan: Season 2, and this page will be updated with any changes. Attack on Titan: Season 2 is not available in Argentina BUT it can be unlocked and viewed! With his hometown in ruins, young Eren Yeager becomes determined to fight back against the giant Titans that threaten to destroy the human race. To stand up against skinless giants who devour humans for pleasure, it takes a strong mind -- and a lot of rage. Season 1 of Attack on Titan has 25 episodes. Because different Netflix countries have different availability for episodes, you'll need to check the episode listing below to see which are available in Argentina. You can also click on any episode below to get more information on which Netflix countries it is available in. After 100 years of peace, humanity is suddenly reminded of the terror of being at the Titans' mercy. After the Titans break through the wall, the citizens of Shiganshina must run for their lives. Those who make it to safety find a harsh life awaiting. Eren begins his training with the Cadet Corps. When he struggles with a maneuvering exercise, Bertolt and Reiner offer kindly advice. Annie proves her skill in a sparring session, Jan dreams of serving alongside the King, and graduation day brings shocking revelations and violence. Eren faces off against the Colossal Titan after it appears out of nowhere and knocks a strategic hole in the Rose Wall gate. 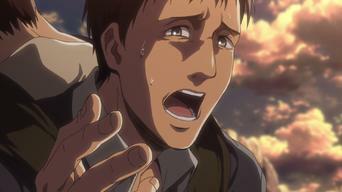 Armin copes with the loss of his friends and allies after Titans massacre his squad. 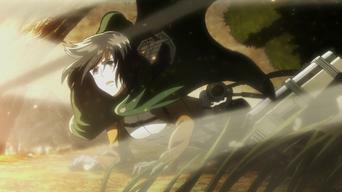 Elsewhere in the city, Mikasa takes out several of the monsters. After the retreat bell sounds, many cadets lack enough fuel to scale the wall back to safety. A new type of Titan stokes Mikasa's will to fight. Armin comes up with a risky plan that pits Titan against Titan as the abandoned Cadets attempt to take back their headquarters. Cannons are fixed on Eren as he struggles to remember what happened to him inside the belly of a monster and how he ended up humankind's enemy. Cadets respond to Eren's terrifying transformation with doubt and fear. Armin must convince the commander to use Eren's powers for the good of humans. Plans are made to use Eren's powers to seal the hole in the wall so as to reclaim Trost. But the biggest threat to humankind may not be the Titans. The plan to reclaim Trost falls apart when Eren's newfound powers turn him into a mindless giant. Meanwhile, Titans continue to swarm the city. Jean takes desperate measures to replace his broken maneuvering device. Eren is able to plug the hole in the wall with help from his fellow cadets. In a special military tribunal, the Military Police calls for Eren's execution, but the Scout Regiment argues he's a powerful resource for humankind. Eren is moved to an abandoned castle to continue his training. Hanji has been putting two captured Titans through a series of tests and trials. Everyone's a suspect in the investigation to find out who killed the test-subject Titans. Meanwhile, the Cadets struggle to pick which corps to join. As the Scout Regiment begins its push toward Shiganshina, they encounter an intelligent Female Titan unlike any they've seen before. The Female Titan keeps tearing its way through the Scout Regiment. Levi splits the ranks and sends Eren and the supply wagons through a huge forest. As the Female Titan continues to slaughter members of the Scout Regiment, Eren faces a difficult decision: trust his teammates or act out on his own. 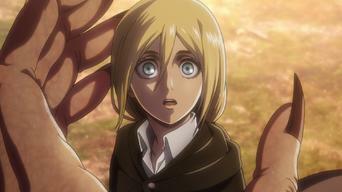 The Female Titan's been captured, and it's Erwin's goal to find out who the human is lurking inside it. The Scouts realize there's a spy among them. A traitor's infiltrated the Scouts, destroying their ranks from within. When she takes the form of the Female Titan, Eren prepares for a brutal fight. After watching Eren get swallowed by the Female Titan, Mikasa and Levi follow the brutal monster in the hopes that he's still alive inside her. After the failed scouting expedition, Eren and his superiors are summoned to the capital. 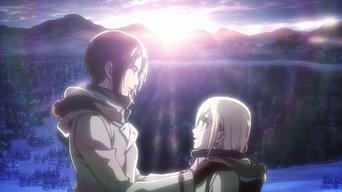 Annie agrees to join Armin in a plot to defy the government. When the identity of the Female Titan is finally revealed, she goes on a rampage within Wall Sina. 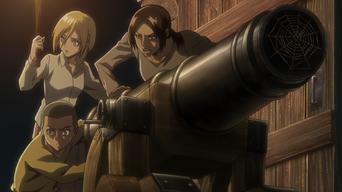 Armin and Mikasa try to stop the towering monster. 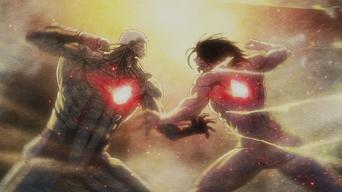 Eren goes head to head with the Female Titan in a fight, demolishing the Stohess District inside Wall Sina. 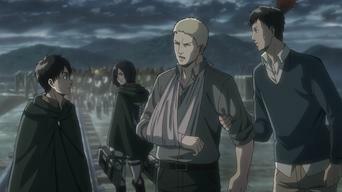 Erwin faces the consequences of his plan. Season 2 of Attack on Titan has 12 episodes. Because different Netflix countries have different availability for episodes, you'll need to check the episode listing below to see which are available in Argentina. Immediately after the battle with the Female Titan, the survivors spot a sleeping Titan inside the walls. Zoë demands answers from Minister Nick. 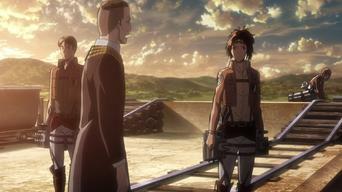 The Survey Corps regroups and departs for Wall Rose, where the Titans are reportedly assembling en masse. Meanwhile, Sasha heads for her old home. Finding Connie's village abandoned, the squad moves out. Meanwhile, the scouts on Wall Rose have not yet seen any sign of Titans. Two hours before the Titans attack Castle Utgard by night, Ymir ridicules Connie's story about the Titan in his house, but Reiner wonders about her. 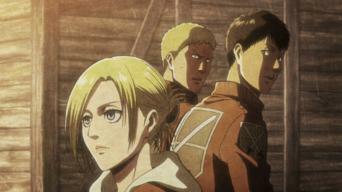 With the Titans surrounding the tower, Ymir recalls a training incident when she and Christa were lost in a blizzard. The main force of the Survey Corps arrives after Ymir's desperate stand. Ymir is sent to the Trost District for treatment while the Corps rebuilds. 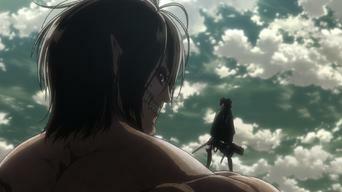 Eren takes his Titan form in order to fight. Mikasa regrets her missed chance and Zoë leads the corps in an attack on the Colossal Titan, but fails. The Colossal and Armored Titans manage to kidnap Eren in his human form. Erwin and Levi are informed that the Survey Corps has taken heavy losses. 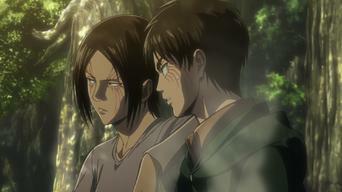 Eren awakens in a forest with Reiner, Bertolt and Ymir, who is also injured and weak after surviving her Titan state. The Survey Corps arrives at the Forest of Giant Trees with one hour until sunset. Their goal is to find and retrieve Eren, but Ymir has her own ideas. The Armored Titan attempts to flee with Eren on his back, and Mikasa attacks him desperately. Meanwhile, Erwin is leading a charge. The horde of Titans following Erwin overwhelms the Armored Titan. 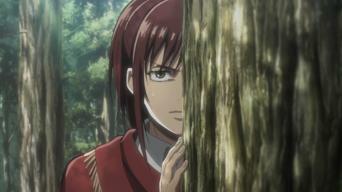 Just as Eren and Mikasa are about to escape, they see a familiar face. Season 3 of Attack on Titan has 12 episodes. Because different Netflix countries have different availability for episodes, you'll need to check the episode listing below to see which are available in Argentina. Now part of Levi's squad, the remaining friends hope to fix the wall. But after hearing about the Military Police's actions, things change quickly. Levi recognizes the man who's slaughtering his team but quickly finds himself cornered. Later, Armin must do something he's never done before. Back together with her father, Historia learns the true history of her family. Meanwhile, Hange reveals a secret by cleverly tricking her prisoner. Levi gets some help clearing a military checkpoint. Hange rescues Flegel Reeves from the Military Police but he's terrified of cooperating. Erwin makes his case but the king and his council are unsympathetic. Before the sentencing can be carried out, a surprising announcement is made. Eren wakes up to see Historia and Rod Reiss, who lead him to recall a tragedy. Meanwhile, the military realizes their memories are at risk. Levi and his squad battle Kenny above the floor of the Underground Chapel. Soon after, Rod Reiss pressures his daughter to make a pernicious choice. Rod Reiss transforms into a Titan so enormous that the Underground Chapel begins to crumble. Squad Levi rushes to rescue Eren despite his protests. Rod Reiss's Titan emerges onto the surface, roasting everything in its path. But the District Garrison's attacks don't keep it from reaching the Wall. Years ago, a young Kenny Ackermann meets an enemy, Uri Reiss, and becomes his unlikely confident as well as the caretaker of an orphaned child. Two months after her coronation, Historia lives the idyllic life she had desired. Eren finally remembers the identity of a man close to his father. The Scout Regiment prepares for their long-awaited operation, the recapture of Wall Maria. Levi tries to convince Erwin to remain behind. The Disastrous Life of Saiki K.
Want to learn how to get American Netflix in Argentina? We are not associated with Netflix, nor do we pretend to be. We are simply giving you the best information on what is new on Netflix around the world!